The night of February 28th, 2016, John Macdonald, 68, was out for a drive on the backroads in Perthshire when he became aware of a strange noise coming from above his car that sounded like a thousand Hoover vacuum cleaners. He said the noise was much louder than his Jeep. As he looked up, he was amazed to see a large object hovering above him. The object appeared to have multiple rows of lights. 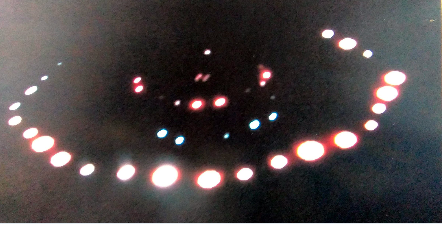 He quickly grabbed his camera and snapped this picture of the sighting. Macdonald estimated that the image was captured at approximately 50 to 70 yards. 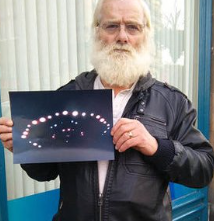 There have been suggestions that the UFO was a drone. This is due to the increase in the unmanned vehicle activity lately. That’s possible, but drones usually require line of sight operation unless it is a higher tech unit than most. A drone pilot, Jonathan Hall, from Southport, U.K. was contacted for his opinion on if the craft could have been a drone. “I have no idea what it is, but am pretty sure it’s not a drone craft. I have flown quite a lot at night and the size and shape of the lights look like no drone I have ever seen before.” stated Hall.